Great post. Would love to hear more about your travels, including how you organised your tour..? Thanks for replying. I meant your time in Iran. I’m interested to know more about how you organised it. Happy for you to email me directly if it is easier. Hello & great to find you ! Like everybody else here would REALLY appreciate as much info/help as possible, as a Brit who is planning for end April/May 2018 independent travel in Iran. PLEASE !! Fab to read about your travels in Iran, my husband and i are interested in travelling to Iran alonwith our eight year old daughter, however we don’t want to be tied down with having to be with a tour or with a guide all the time. I have contacted some travel agents for visas last year and the response was we are unable to travel on our own or get visas as we are UK passport holders. I am actually Indian born with a British passport. Reading your blog has raised some hopes so would be really helpful you would be able to point us to how this was possible for you? Look forward to hearing from you. Hi Fatima, thanks for your message could you please reply here with an email address and we can send you what we have. We won’t publish your comment so your email won’t appear on our website. Hi Annie and Paddy. Great post. I’m really interested in travelling to Iran – could you let me know more about how you sorted your visa! Thanks! good luck with your travels…. Hi, this sounds like a great adventure. I would be interested to get info on how you obtained your visa to enable such independent travel in Iran. Hey guys!! I’m SO glad my fiancé found your website. We’re leaving to cycle the world in 10 weeks and would love to talk to you about getting a visa for Iran and a bit about cycling the rest of the places you’ve gone. We’re kind of doing what you did in reverse. Please drop us an email and we can chat if that’s OK with you? Hi guys! Great blog 🙂 I’m would also be very grateful for more details of how you organised your trip! Including my email here. Thanks!! Hi, great blog post, interesting read! I would like to talk to you about how you obtained your visa for Iran and your experience, could I message you directly? Hi! Great post, interesting read. I would love to know more about how you organised your visa for independent travel in Iran. Am planning to go there in May but running into the same issue of being British and only being able to organise an official tour. Could we email directly? Thanks so much! I’m an Iranian and my girlfriend is a British citizen, we are planning to go to Iran, We are living in Vietnam now, I looked around on internet and asks some agencies in Iran, all are talking about booked hotels and guide and this kind of things, I will be so happy to know how you did it, thanks a lot . Hello! I came across your page and i’d also like to find out which company you used if possible. Nice to see you had a great trip! I was hoping to take a few weeks off travelling around Iran maybe next month but then saw all this info about visas, guided tours, etc…as a Brit. Can you offer any advice about going their independently? What a wonderful and epic journey! I would love to know more about your Iranian adventure and how you managed to receive your visa?! Great post and what an amazing adevnture you’re on! I would love to travel to Iran later this summer with some friends from Italy and have been trying to find out about visa situation, but information is not forthcoming. I have some friends in Iran and not sure whether its easier for them to be my sponsor which can allow me to travel independantly? or whether its easier to go through an agency ( but hopefully not go on a tour, is that possible?) My Iranian friends would probably only want to join me for part of the trip, if that’s allowed? Any recommendations you have would be great! Thanks in advance. 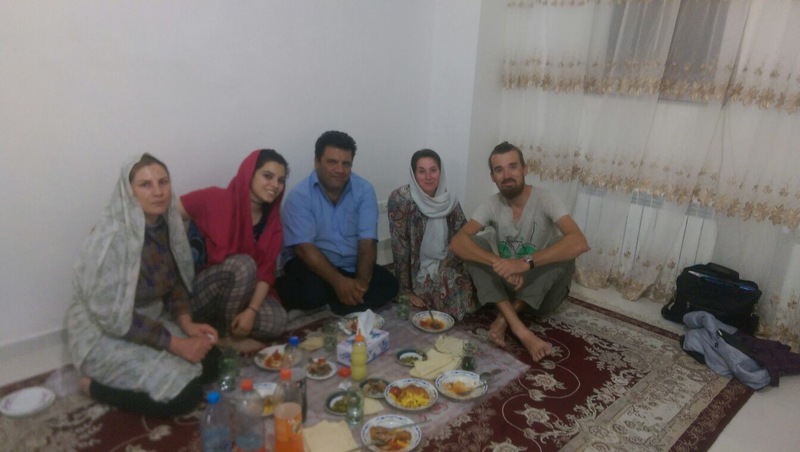 We loved your blog and are hoping to travel independently in Iran as British citizens. Would be great to know how you managed it please. Please provide an email – we won’t post it so your email will remain private. I am Julian travelling solo by bike towards Turkey, Iran and the ‘stans. I am interested in travelling independantly in Iran and will appreciate any advice (particularly on how and where to get a visa) you can give me. Thanks for writing about your trip, it’s very interesting and useful! I am British and hoping to visit Iran independently in October. I would be useful to know how you arranged your visa. Hi there! I really enjoyed reading about your travels, and you’ve piqued my interest in travelling to Iran. However, I’m a British citizen – with all the potential problems that entails. Would you please be able to send over the details on how you obtained your visa? All the very best, and thank you in advance! 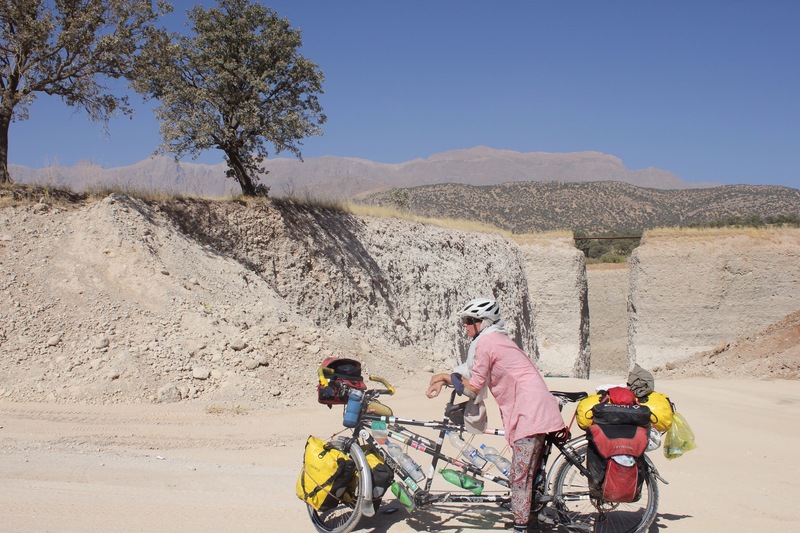 Hi Annie and Paddy, great to read your blog, please do forward me the info on cycling in Iran. Thanks! Hello thank you for this website, just amazing amounts of useful information. Have travelled extensively around the Middle East and as a British citizen, Iran is the one place I haven’t been able to visit, and its my dream to do so. Would you be able to send me details of how you managed to do it? Thanks again for sharing and good luck with your future travels. Please provide an email – we won’t post it so it won’t be seen by others. Thanks! I am a British passport holder and have been hitching in Greece and Turkey for the past few months. I now would like to hitch hike through Iran, (for at least a month, longer if possible) to Pakistan and India. I already have visas for Pakistan and India. I would be extremely grateful for any information you could provide on how to get an Iranian visa so that I can continue my hitching trip. Hi John, please send an email and we will send you the info we have – although it’s a year out of date now so you might want to reply to the comments above to and see if anyone has also been successful since us. We have never heard back from anyone re success or failure so are a bit out of touch with the situation now. We won’t post your email so it’ll remain private to just us. I endeavour to cycle through Iran in a similar fashion to you guys, I’d be very grateful for any information regarding how you acquired your visas and organised your trip with all these restrictions in place for British citizens! Hi Touba – it is great to hear from you!! Have you tried applying for a code for your friend directly with your local foreign office. As an Iranian our understanding is that you can apply for the code directly. If you would like the email too please send an email address here and we will send it to you. I would be ever so grateful if you could forward the information on travelling independently to Iran. I am intending to motorbike there – do let me know if you have any information on taking a vehicle in and out of the country. Please provide an email address! Thanks! Please provide an email and see other comments. Hey guys, a truly inspiring tour! As a Brit I would be very grateful if you could send me your (very popular) information on getting into and travelling independently through Iran. That would be very helpful indeed. Thank you! Please provide an email and we will send you stuff! Hi guys, I was just wondering if you’ve sent the email because I have yet to receive anything. Did you get my email address? Thanks! I. too, would appreciate your information on getting a visa to, and traveling within Iran. (Not British, though, and I’m not traveling by bicycle or motorcycle). Hi Joe – what nationality are you? What you have done is truly inspiring. I too dream of independently traveling through Iran someday, specifically by hitchhiking. I’m an American citizen, but I hope what you have to say still applies. I know your information is considerably out of date by now, but I’ll take what I can get. I’ll leave my e-mail in the following comment. Please send me the usual e-mail. Hi guys, thanks for the blog. Good to hear that it may be possible to cycle through Iran indecently as a UK citizen! I would really appreciate any extra info you have regarding the visa application process, especially if you have heard of any recent issues with the process. I’ll comment my email below. Thanks a lot, Tim. Hi Tim, I’m trying to get some more info about getting an Iranian visa so I can cycle for a couple of weeks – if you or anyone reading this has any information that would help I’d really appreciate it. I’ve tried Paddy and Annie but for some reason the info didn’t get through! Hi Justin. Unfortunately not. I have contacted various Iranian sources and they all suggest that in order to get a visa authorisation code from the MFA, a detailed itinerary is needed including contact details of the guide who will be responsible for you at all times. I’m in the process of seeing if this is flexible in any way (i.e by having a guide for some of the time), but so far nothing positive has been confirmed. I believe the rules have become stricter in the last few years so previous information may not be so useful anymore. Hi Kaan if you can get an authentication code and issued a visa in our experience and others you won’t have any problem travelling in Iran or crossing the border. Iran is the most hospitable and friendly place on earth! Has anyone accomplished getting an authentication code recently for Iran , Its always be one f my top spots ive wanted to visit and think I may give it a go in April. Confirming that in order to get a visa authorisation code from the MFA, a detailed itinerary IS needed including contact details of the guide who will be responsible for you at all times. I’m now in the process, having found a private guide at a daily rate including the cheapest places to stay, which are booked in advance & mostly already paid for by him AND all of which MUST be stated in the application, which he has had to make on my behalf. This was submitted to the MFA Feb 1st & I have been advised it can take up to 50 working days. Meanwhile everything closes down over there between now & most of March for various public holidays including Nowruz (Iranian New Year). Also & as mentioned by another, above, the process HAS become stricter in the last few years however I can also report that the rules about screen shots of all social media accounts, as previously stated are now no longer necessary. Something else to think about, if/when in Iran & visa about to expire (within 3 days) it can be renewed/extended. Good Luck for April ! Really useful update on the Iranian Visa situation, thank you! Can I ask whether, having found a guide to help complete the itinerary and application, he/she must accompany you throughout? If you wanted to cycle alone is there a risk of being stopped, do you know? Also can I ask how you went about finding the guide that was prepared to help and do you think they or associates might do it again?? To confirm & repeat, and as it stands at the present, Brits, Americans & Canadians must either join a tour or be accompanied by a state authorised guide at all times as this guide or travel agent organises the facilitation of the MFA authentication code in order for a visa to be applied for and as such are responsible for you ! Perhaps ANNIEANDPADDY, as others in the past have managed, organised their independent trip, by paying an agent for a fictitious ‘tour’ & ‘accommodation’, consequently providing them with a MFA authentication code which then allowed them to get a visa, but once in Iran they travelled around on their own. However having had no contact from them this is only a supposition. In any case once the authorities realised that was happening this ‘loop hole’ was closed. Obviously I came onto this forum as I also wanted to circumvent the ‘itinerate & accompanied’ procedure. However it is highly unlikely you would find either a travel agency or a guide, whom would need state authorised documentation, to now do this for you. This would risk them losing their license & obviously would result in serious trouble for them. Possible alternative’s : check out the Iranian mountain bike enthusiasts site http://www.gashta.com ; find a local Iranian, thru contacts etc, who would organise a private invitation & MFA code, altho’ they would still be responsible for you ! Or as I mentioned, read between the lines, extend your visa. As for your question about wanting to cycle alone & as to there being a risk of being stopped, bear in mind that Europeans & other nationalities are travelling around freely &, as yet I’ve personally not come across reports of “being stopped” & problems arising from this. Finally, I have used my ‘guide’ before, and as much as he is “prepared” to “help”, this is his job, which as stipulated includes accompanying me, which I am paying for, albeit it’s for my desired itinerary. In terms of finding guides, search forums & follow up on recommendations is the only advice I can give, more I can not add ! Hi Fi. Your way is certainly a way of doing it but as proved by us in September 2016 and confirmed the recent British traveller (Feb 2018) – just posted updated info on our original blog – who also recently got a visa in Turkey – independent travel in Iran is possible. Thanks for sharing your experiences. All we can all do is share our own info and knowledge. We got our info from another traveller so this independent travel has been achieved by some travellers for ages. The authorities had no problem with me travelling independently in the country when I was there. I was stoped and passport checked very regularly. Thanks for being in touch. Have now read your update & the Ankara travel agent IS a useful source for those in/going through Turkey, in order to be able to provide the Iranian MFA code without committing to anything else. In 2015 I also discovered a Turkish (travel agency) connection as a possibility, which by the time I was ready to go it had ceased working, however not this one. So it’s most interesting to hear about although not of much use to me now, being committed to pay up once reaching Iran & with my MFA code received, same as in 2016, took less than 3 weeks, as similar for your Feb 2018 friendly traveller, not the 50 working days as stated by the authorities. This one via my state authorised guide, who incidentally is unattached to a travel agency, fortunately, so obviously cheaper. All in all THANKS again, for your useful blog, appreciated. Thanks so much for this Fi – really useful. I’ll definitely follow up the local Mountain Bike group – and if I can’t find a way of travelling solo will look at finding a local guide to accompany me for a couple of weeks. Just love the idea of wild camping or staying with local families which I’m sure wouldn’t be as easy if I was travelling with a guide. Hopefully other followers of Annie and Paddy will keep updating on the situation in case things change or formally become more relaxed. You’re welcome Justin, anything to encourage travellers to Iran, where the locals are so incredibly friendly & hospitable and because there is a huge unemployment problem along with all the other financial woes thanks to sanctions, collapse of the currency & price rises, work provided by ‘travellers/tourists’ does help. As much as a local state authorised guide (but avoid travel agents) helps with the MFA code/itinerary, if you mention you want to avoid formal hotels, there are also whats called ‘ecolodge’s’ which are family run & so thats what you find when using them; including tents/sleeping on the floor etc. Also once in Iran maybe your ‘guide’ can deviate a little from the organised places to stay & then you might be able to end up staying with local families as well. I suggest you STRESS this in advance to which ever guide you find, making it absolutely clear what you want. Just bear in mind that their daily costs include their accommodation too ! As for “wild camping” that might be harder to achieve with a guide !! One way or another, especially if you go off the beaten tourist track, you’ll be overwhelmed by the interaction with the locals & probably with invitations to peoples homes, which I can honestly attest to ! Thanks Fi, yes read Annie&Paddy’s update which was really interesting. I may struggle with that route though as I’m fairly limited on time with only 2-3 weeks in total, making doing applications in person in Turkey difficult. Sounds like a truly amazing journey! I’m looking to travel independently in Iran this coming year and was wondering if you could tell me how you managed to get the visa to do it? Hiya – all the info we have is now up on the website. I wanted to apply for a visa to Iran from the UK but I hope to enter and leave via the borders of turkey and Pakistan on the train. I was wondering how I would go about applying for a visa as a British passport holder.